Ad delivery option is a setting for Facebook ads what type of traffic you would like to acquire. That is, what action they should take after seeing your ad, which is then set as the conversion objective for your ads. Nosto's tooling adjusts the bidding objective on your behalf using auto-mode and we recommend only seasoned advertisers to set the objective manually. By default the admin UI suggests the auto-mode as below. When selected, Nosto optimises for purchase conversions (standard e-commerce event), but if the ads are unable to deliver recommended amount of conversions in a week, we automatically adjust the conversion objective towards an event higher up in the funnel. First, Add Product to Cart and if needed, towards View Product event and finally to ad clicks. Seasoned advertisers can also select the objective manually by disabling the auto-mode (as below). We cover a few examples when manual optimisation can yield better results than the auto-mode. Note that when you're optimising for ad clicks by disabling the auto-bid as well, only the click ad option is available. Optimising for ad clicks and selecting bid manually by moving the bidding strategy to classic CPC is a good option only in few, relatively rare cases, also covered later in this article. Selecting the right objective for your ads can have a massive impact to how well your ad campaign performs and in next few chapters we cover a few good guidelines how to use the ad delivery options. Like always, guidelines are good when you're about to get started, but once you learn more about what works for your business, ads and ad creatives, you can and should adjust objective(s) based on your experience, targets and preferences. By default Nosto uses (website) purchase conversion as an objective for your ads, but you can override this and use also ad clicks as an objective. When website conversions are used, the billing point for Facebook is always based on [thousand] ad impressions, meaning that you pay Facebook for when your ad is shown, whereas ad click objective uses standard cost-per-click as a billing point. The purchase conversion objective basically tells Facebook what type of traffic you want to get on your site, and as the name suggests, purchase goes after audience who are according to Facebook's data more likely (or ready) to buy. In case you optimise for Add Products to Cart, you're essentially telling Facebook to optimise ad delivery to users who are more likely to add product to the shopping cart, product view optimizes for product page views, whereas when you select Click Ad, Facebook shows your ads to users who are more likely to click it, typically optimising towards more click-savvy audience. If you read this article, it is likely that you work in e-commerce or digital retail, and you assumably ask yourself why shouldn't I always select purchase product as an objective? If your budget or target audience is really small. If you can afford to spend only $5 - 10 a day or if your target audience is just a few hundred to few thousand users monthly, it is not very likely that your ads are able to deliver meaningful amount of conversions. 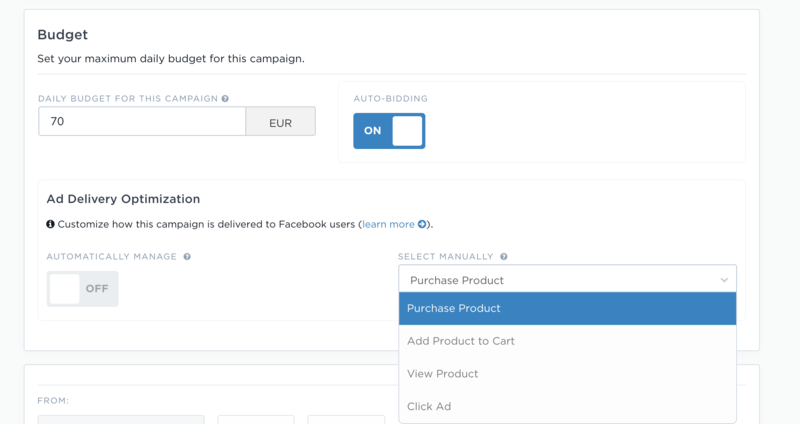 Facebook's algorithms work well only when your campaign (on an adset level) can deliver 15-20 conversions a week, meaning that you might have better performance if you optimise for a conversion objective higher up in the funnel than purchase e.g. add product to cart, if your campaign delivers less than this. Testing what works on your site is the key: We have seen campaigns working really well with small budgets and tiny audiences, even when purchase conversion is selected, so treat the quota of 15-20 conversions a week simply as a rule of thumb. Commonly, abandoned cart re-targeting works almost always well when purchase objective is used, regardless of the audience size or budget. If you're running awareness or consideration type of campaigns and going after top-of-the-funnel clients, who are completely new to your business. In this case your target could be to get decent quality traffic at the lowest price to your site. This means that view product could be the best option when going after new clients. It is statistically rare that completely new customers would convert immediately, if ever, but if you go after new visitors who you acquired to your site with re-targeting a few days after, you are able to acquire clients back on shopping. In other words, build your conversion funnel. Your immediate goal should not always be a purchase conversion, but to get qualified users to visit your site first, while re-targeting on Facebook and elsewhere drives them down the funnel towards the purchase conversion. When you run a tactical short-term campaign, like 24h flash sale. This one is related to the first point and recommended quota of getting 15-20 conversions a week. When you launch your campaign, Facebook explores what type of users they should show your ad, meaning that there will be a fair share of misses before the system picks up the right type of a target audience, assuming your audience is not a very-well qualified group of users like your existing customer list. Even in this case, you might deliver better results faster by going after a website conversion objective higher up in the conversion funnel instead of an ad click, as it is a statistical fact that you will generate 20 product page views or add-to-cart events through ads way faster than 20 purchase conversions. As a sidenote, this tactic doesn't necessary apply in other contexts than e-commerce. When to use click bidding? Optimising for clicks and setting CPC (click-bidding) is typically a good option only when your campaigns are short-lived and you want to reach the maximum amount of users who are likely to click an ad. Optimising for clicks goes after users who are more click-savvy, and doesn't look into the event stream that happens after clicking an ad e.g. will they actually add anything to their shopping cart or buy something. Also consider the ad creative and how this might affect click-savviness. Read more about bidding and optimization here. Nosto's ad campaigns are built for direct response and to drive immediate actions on your site. However, if you manage your ads in the native interface and use only Nosto's audiences for ads (available on annual plans), you might want to use other objectives like video views as an objective when you want to drive awareness. Engagement audiences are a good way to go after users who have interacted with your videos or other content on Facebook or Instagram. Build your sales funnel by showing content like videos to users at the top of your funnel and move them down in the conversion funnel with re-targeting using different ad formats, such as Video to Collection to Carousel.